It’s a muggy summer night. Rustic, propulsive rhythms and sinuous melodies surge through the humid air, headed straight toward your unsuspecting soul. From the music comes a woman's voice, thick in its sensuality, raw in its expression. Such is the feeling you get when listening to Jennifer Leonhardt’s new album, Gods & Nations. Impressive in its overall sound, the album comprises a mix of acoustic and electric-textured songs, evoking folk and blues in ways that sound contemporary, relevant, and most importantly, compelling. Such a mixture makes for great effect, like when the subtle yet affecting track, “Homeland,” bleeds into “City Stories,” which boils and builds toward a sonic collision. Percussion plays a vital role throughout the album, although more for purposes of accentuating rather than dictating the tempos of the tracks. Weaved seamlessly through the album is Leonhardt’s voice, a striking and soulful instrument, which deftly varies in tone to suit the architecture of each song. On the bluesy “Love Junkie,” Leonhardt’s voice sounds gritty and bare. On the raucous “Here Comes Trouble,” it sounds like a roaring yet sultry siren. The axis where the most stirring music meets with the most impassioned vocal is “U Wear It Well”. Possibly the finest track on the album, this song aches in an echo and sway of vulnerable tenderness. 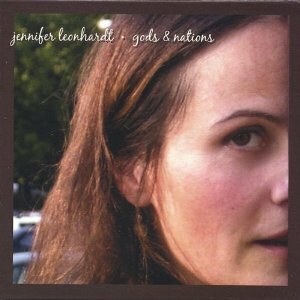 Jennifer Leonhardt wrote all but one track on Gods & Nations (a riveting take on “Strange Fruit” being the lone exception). With her skill in creating and crafting quality songs, with her versatility in conveying those songs, Jennifer Leonhardt proves herself a genuine talent. Gods & Nations is the impressive result of her abilities and, based on this effort, it should merit this musician a promising future.